shows the whole Universe that's rotating through our planet's sky above each and every one of us every single day of our lives. The undulating line through the middle of the chart exactly marks the position of the Universe above Greenwich England on the specified date at Noon at Greenwich. That also tells us what's above every position on our planet at that time and date. Every other physical position on our planet, and every other celestial position in the sky, is measured in hours before or after its relative distance from Greenwich. Measuring our distance from Greenwhich identifies the point of the universe that will be above that point on the Earth, at local Noon of the specified day. Each of our positions on this planet is offset from Greenwich by a certain amount of Hours & Minutes on our rotating planet. The slice of the Universe we can actually see at night and what is overhead at Noon gradually changes with each passing day, as each day's rotation brings, "new sky," into view as it leaves another behind the, "old," as we gradually step around our planet's annual orbital viewing of the Universe. It takes a year for us to view our whole universe once, at night, even as the whole thing rotates around us every day. Half of our "daily" view of the whole universe spinning around us every day is invisible, being "washed-out" by the daytime passage of the Sun, leaving only our nightly slice, our slice of our outward, "night-side," view of our Universe visible to observe. Our important questions are, "What slice of the night will we see at Night during our backpacking trip? What "slice" of the Universe will be washed out during the day?" These questions are practically and esthetically important. This page is hopeful it will answer those questions. 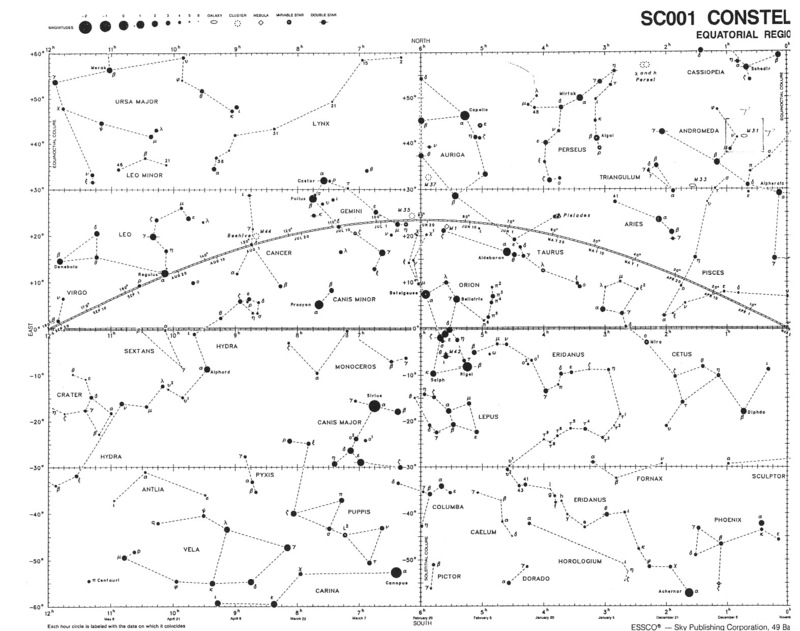 The dates along the curving line undulating across the center of the All-Star Chart below correspond with the point in the sky above Planet Earth at 12 noon at Greenwich, UK, on that particular date. Our positions in the Sierra are 8 hours West of Greenwich during Standard Time, and 7 hours during Daylight Time. This Classic star charts show us exactly what we cannot see in the sky during the day. What's overhead at midnight of any particular date is not quite exactly six months different than the "Sun" dates on the chart below. That's why I've included the Digital Star Wheel below. This celestial information will be more important the further out into Nature that we hike, as the deepening darkness of wilderness opens up the depths of night skies to our experience. I want to know exactly what I am seeing, and why. Our planet-wide destruction of dark night skies (we neglect nothing) diminishes and disappears the deeper we push into wilderness, finally revealing the full depth of Time and Space around us. These observable expanses bring up questions in my mind, such as what time is it, really, in terms of exactly where our planet is pointed in our Galaxy and Universe during Day and Night? We've already used astronomical intformation to figure out basic local Noon and backpacker timekeeping. Now we want to put our daily Night and Day observations into a bigger "annual time" context, withing the physical reality of our own galaxy and the greater universe beyond. Set the TIME feature to Noon (and check "show daylight") to determine what part of our Stellar Universe is washed out by the Sun at the midpoint of day during daylight hours. Setting the TIME to Midnight shows us the what part of the universe is visible directly above us, which centers what's visible between Sunset and rise. 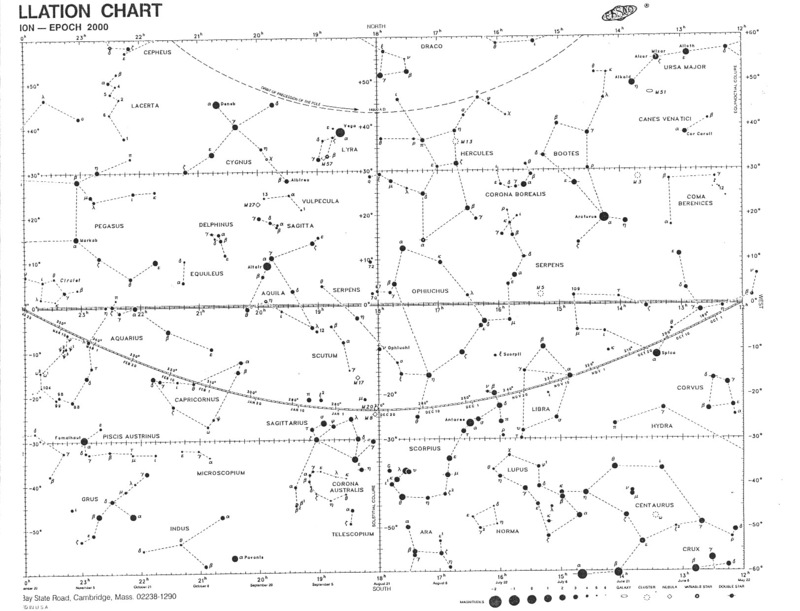 Identify those positions on the whole year star chart below, and you will know what is passing overhead at Noon during the day, and be able to identify the seasonal constellations bracketing Midnight. Let's go to the next step, and figure out the main stars too. Fire up the digital star wheel. Click the show "Alt/AZ grid" checkbox, then bring your cursor to the center of the circle in the middle of the Sky at Noon and at Midnight. Our goal is to determine Noon and Midnight's respective Right Ascension Times. These coordinates read-out on the upper-right of the page. Note them. Match these "RA Times" with those positions on the Star Chart below to see exactly what's straight overhead at Noon and Midnight, which puts the rest of the night and daytime skies into context, and puts our seasonal slices of Time into the biggest context. Yup, that's it, and all there is. Our whole Universe spins around us every day. Midnight and Noon define exactly what perspective we are going to have on the universe spinning around us every day and night of the year. Despite the fact that it takes a whole year's worth of nightly (and daily) observations to view the totallity of our surrounding universe (twice? ), which, all together makes one (two?) full circle(s) around us each and every day. The whole universe spins around us twice a year. Once visibly, at night, the other invisibly, during the day. The center point of our physical celestial map below is anchored in time by the position of the Sun in the Sky at 12 Noon on the Vernal Equinox (March 20) in Greenwich, England, as measured on the sine wave (wiki) of the Earth's elipictic on the map below. This elipictical undulating line across the center of the map below marks out the effect of the Earth's off-axis tilt during one orbit around the Sun. It represent where we are. "pointing," so to speak. Sometimes the Earth is pointed "up,"along this "line," other times "down." Our celestial "start point" of the year is the Vernal Equinox, which is the point in time when the tilting plane of the Earth is flat, halfway between its up and down rise and fall along itst elipictic path. The Sun position dates across the Elipictic on the Star Chart below reflect Noon at Greenwhich, and must be adjusted for your local Noon. Thus the utility of the "In the Sky" star wheel for ascertaining local times. In addition to ascertaining stellar and constellation positions at Noon and Midnight, we can measure the daily movement of Sun and the stars at night from our local reference points since we know that the sky rotates 15 degrees for each hour that passes. Again, our whole map rotates once a day. 15 degrees is the width of every typical human hand! A "hand" is not just an ancient Egyptian measure of horse heights (hands) , but a span of celestial Time, too. These relationships between Time, Space, our physical position, and the width of our hand means that we can use the workings of Nature Itself as references in Time and Space along the length of our backpacking trip, making Nature itself our fundamental field clock and compass. We backpackers are the "crazy hands" on Nature's Clock, and the "spinning needle" in Nature's Compass. Using astronomical timings requires we look up and record some fundamental astronomical information to bring on our trip. Natural Timekeeping may sound complex now, but it quickly becomes "first Nature" with a little use and practice. It's the stupid watches and GPS that are unnatural. We were made to be Reflective of Reality. will be almost exactly 12 hours apart. Almost 12hr because this perfect daily rotation of Earth is lengthened by its moving one day along its orbital path around the Sun as well as one Earth "rotation" on its axis. Two motions affect the length of Earth's days. The length of the Earth's daily spin is affected, slightly lengthened, by its motion along its annual orbit around the Sun. This motion along our orbital path as we spin creates a difference between Sidereal Time, or our "orbital time" vs. Solar Time, which would be our "rotational," or daily "spinning" time. The whole universe spins around us every day, though we only see around half of it, more or less, depending on what time of year it is, and if we are lucky enough to have dark skies and good eyes. Hitting the trail is going to improve our nighttime visibility, which requires some study to make the most of the fundamental beauty and knowledge watching the operation of our Universe brings. We will study the digital sky wheel linked to above. We will take note of, and become familiar with the key stars and constellations before we depart. We will print out a paper Sky Map for Field Use. We will note Sun rise, noon, and set times & bearings in our "Trail Journal & Land Alamanac" so that we can tell time and find directions using the fundamental workings of Nature. The current "Elevation," or "Size," of the Universe appears to be Aprox. 14 billion Light Years from "Top to Bottom" and "Edge to Edge:"